Telepathy refers to the transmission of information from one person to another without the use of speech or any of the other accepted senses, although extraterrestrial beings are often said to have telepathic abilities as well. The term was coined by Frederic W.H. Myers, a founder of the Society for Psychical Research (SPR), in 1882, and the word soon displaced the earlier term, which was thought transference. Although scientific concepts were applied by Myers and SPR co-founder William Barrett, they were criticized for trying to prove telepathy rather than to objectively analyze whether or not it existed. The credibility of SPR tests were further harmed after a group of sisters, Mary, Alice, Maud, Kathleen and Emily Creery, who were tested by the Society for Psychical Research and believed to have genuine psychic abilities, but were later caught using signal codes, and they eventually confessed to fraud. Others were also found to be frauds after having been deemed genuine by SPR testing. Nevertheless, while pretty much everyone will concede that there have been, and are frauds among the psychic community, many will argue that this is not true of all psychics./ Within the field of parapsychology, telepathy is considered to be a form of extrasensory perception, and is often used as a synonym for precognition and clairvoyance. Forms of telepathy include instinctual, mental and spiritual telepathy, although various sources will use differing terms and other divisions. 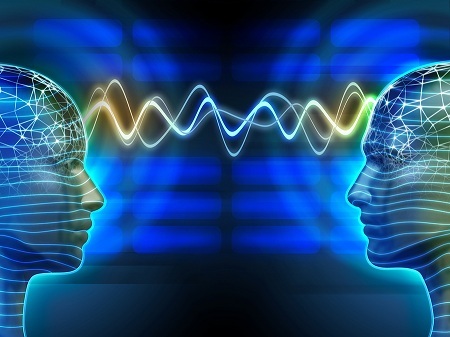 There is a common belief in telepathy between twins, although skeptics deny that there is any validity to any form of telepathy, relegating it as a pseudoscience within the field of parapsychology. Nevertheless, a belief in telepathy has been popularized in modern times through New Age philosophy. According to a Gallup poll conducted in 2001, thirty-one percent of Americans believe in telepathy as defined as communication between minds without using traditional senses. Within the field of parapsychology, telepathy refers to the ability to feel, think, or hear something from far away, through the use of paranormal powers of the mind. Generally speaking, it refers to the paranormal ability to send or receive thoughts from one person to another. Telepathy is not considered to be a genuine phenomenon by scientific consensus, but many studies have been conducted, some of which were intriguing. One such experiment involved Harold Sherman and George Wilkins. The Michigan native, Harold Morrow Sherman, was born in 1898. He was an author and playwright, as well as a renowned psychic researcher. Born in 1888, George Hubert Wilkins, was an Australian explorer, pilot, soldier, geographer, and photographer. Beginning in late 1937, through early 1938, these two unlikely individuals conducted the first long-distance and long-term experiment in telepathy, the results of which were later published in the book, Thoughts Through Space, written by Harold Sherman. Wilkins was assisting in an aerial search for a missing Russian craft and its crew in the Arctic, while Sherman was in New York. The prearranged plan was for the two men to spend time at the end of each day visualizing a mental image or impression of the events they had experienced during the day, and to record these images and thoughts in a journal. Sherman was not provided with flight plans or any other prior information about the expedition. As it turned out, Wilkins never found the time to deliberately send out any impressions to Sherman, who nevertheless carried out his part of the task faithfully each night at the same time, unaware that Wilkins was not doing so. Wilkins did, however, journal the events and details of his day in his log, which was the practice of explorers in that day. When Wilkins returned from the Arctic, his dated log was compared with the dated journal maintained by Sherman, and they found that Sherman had correctly detected impressions recorded in Sherman's log seventy-five percent of the time. Despite the inability of Wilkins to maintain the appointed sending time for the experiments, in maintaining his log, he was forced to think about the day's events, and these were apparently the thoughts picked up by Sherman. In comparing notes, the men found that their records most closely matched during periods of high emotion experienced by either men. At the end of one particularly stressful day, Wilkins had written that cold weather had delayed his job, and that he had witnessed someone's skin peeled off of their finger from the cold, both of which were picked up by Sherman. Conversely, when Sherman was suffering from illness and feeling particularly stressed, his accuracy was high, including the names of people, companies and numerical data. Interestingly, there were also times when Sherman recorded incidents on the day before they actually occurred, including one that involved an oil line clogging on Wilkin's aircraft, a phenomenon that was later cited in remote viewing experiments conducted by the United States government from 1975 to 1995. To be sure, the experiment did not result in all hits and no misses, but even his misses were close and, in some cases, recorded incidents which did occur, according to other members of the expedition, but without the knowledge of Wilkins. Suzan Vaughn has been a student and teacher of metaphysical phenomenon for more than twenty-five years and, as a psychic counselor, she helps people identify issues facing their pets, predict the future, contact loved ones who have passed on, and sort out other problems. Through her site, people may sign up for a session or mentoring, or order books or CDs. Instructional videos, animal stories, and articles of interest are included, with client testimonials. Focused on what the site authors claim to be the cutting edge of communications technology, electronic telepathy is mind-to-mind communication between beings through advanced technology, or technological interfacing and communication between one's mind and a computer or another form of artificial intelligence, and without the use of an implant. A discussion of the technology is advanced here, and books and videos on the subject are available for downloading or purchase. From a skeptic's perspective, the site reviews the various terms that might be considered synonymous with telepathy, offers a history of the term and its brief reign as a legitimate science, criticizing the validity of tests conducted by the Society for Psychical Research and others, and what the author refers to as an abuse of statistics. The types of testing that has been used are also discussed, including varying results. Hosted by R. Neville Johnston and Mary Phelan, Telepathic TV is a call-in television show that showcases ideas and techniques in the metaphysical world. Program schedules are published to the site, along with biographical data for both of the hosts, a schedule of workshops, archived shows, podcasts, audio, and photographs. Free insight readings are available and copper devices may be purchased online. Not an actual school or academy, the Telepathy Academy is a website created by one person, who claims to have always been telepathic. Although he does not give his name, there is a photo, and he discusses his experiences with telepathy, his concepts and methods for teaching or learning telepathy, exercises in telepathy, and general information about his services, which may include the provision of individual assistance. A discussion forum is included, using an SMF script. Telepathy is a board game that combines strategy, logic and deduction. Borrowing aspects of Sudoku, Battleship and Clue with some of the testing that is done to determine whether a person has telepathic abilities, the object being to become the first to correctly deduce the opponent's secret square. Three versions of the Telepathy games are available for purchase online, along with another game, known as Brain-Freeze. Reviews are posted to the site. The Telepathy Project is the work of two Australian-based artists, Sean Peoples and Veronica Kent, who are engaged in a practice based on the possibilities of alternate forms of communication through art, with telepathy and dreams serving as extended metaphors. Their projects have been presented in private and public galleries and festivals in Australia, the United States, Germany, Spain, France and India, often raised collaboratively or with other artist collectives. Search for Telepathy on Google, Bing, or Yahoo!